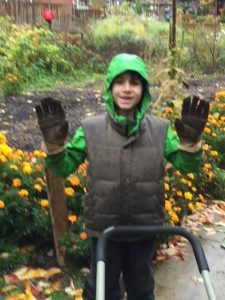 All good things must come to an end, and in this case, a somewhat muddy end, Through the rain and drizzle, a hardy group of 15 volunteers harvested the last of the vegetables, pulled out plants and stored away the tomato cages until the following spring. Our final harvest was picked up by the Community Share Food Bank, which serves approx. 150 families each week. We were able to donate lovely tomatoes, kale, swiss chard, brussel sprouts, leeks, snow peas, herbs and jerusalem artichokes. We are honoured by the commitment and dedication shown by our volunteers and customers. Thank you also to our city partners, as well as our friends at the OHS. We wish everyone an enjoyable winter and hope to see you next May!